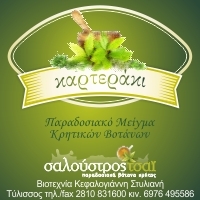 Karteraki (40 teabags) Saloustros Tea was added to your shopping cart. Traditional blend of Cretan herbs "Karteraki" for hot tea, slightly relaxing, ideal tonic for the stomach, perfect for all day times and seasons. Traditional blend of Cretan herbs "Karteraki" is a traditional hot herbal tea, slightly relaxing, ideal tonic for the stomach, perfect for all day times and seasons. Excellent for breakfast accompanied with honey, rusk, cheese and olives. Lovers of hot beverages and all those who are familiar with the Cretan Karteraki, usually order 4-5 boxes at once. It is so light that the shipping cost of several boxes is quite affordable and cost efficient. Moreover, its expiration date is after 3-4 years.